Volgograd: ‘Uchitel’ Publishing House, 2015. – 224 pp. Nowadays, despite the increasing flow of publications on globalization, our ideas and knowledge about this phenomenon still leave much to be desired. That is why the special periodicals and books in the field of Global Studies are of utmost importance for modern society. Of great importance are also the books which accumulate the last achievements of scientific thought in the field of Global Studies. The present edited volume is just the book of the kind. Its title, This Globalizing World, reflects the main idea of the formation of a new World System. 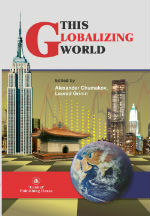 This book comprises the best articles which have been published in the interdisciplinary journals Age of Globalization (published in Russian), its English-language digest, as well as in the Journal of Globalization Studies. The articles included in the volume reflect the today's pressing issues, and they also present a number of forecasts for the nearest future and for the more distant periods of the global development as well. In the present volume one can find the perceptions of globalization by a number of scholars from different countries, whose articles have been published in the mentioned journals.